Kevin is a 26-year-old who sees Chloe Austin, a social worker, for help with social anxiety and isolation. He has been diagnosed with Asperger Syndrome (AS), which he describes as “a disorder that makes it hard for me to get on with other people.” AS is a pervasive developmental disorder that is part of the autism spectrum (Gaus, 2007). The condition is often called high-functioning autism because while individuals with this diagnosis have average or above-average intellectual functioning and verbal abilities, they suffer from a number of typical autism symptoms, including stereotypy and social deficits. Individuals with AS often present with symptoms of anxiety and depression because they yearn for the social connections that are so hard for them to form and maintain (Hofvander et al., 2009). Kevin reports that he is unable to carry on normal social conversations. “People tell me I only talk about himself and my own interests,” he says. “I guess I’m self-centered.” He also is unable to read social cues that alert most people that they are boring or angering others, and people tend to avoid him after one encounter. Because he has experienced so much disappointment and rejection, Kevin is anxious in social situations and has become more and more isolated. Currently he finds it difficult to spend any time at all in the presence of others and rarely leaves his apartment. Kevin is an intelligent, attractive young man. He makes a living as a content writer on the internet, mostly writing blogs and web content about his interests, which currently include Labrador retrievers, aviation history, and opera. Kevin has many online relationships but wants to have more of a social life in the real world. 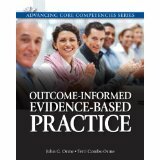 The subject of this chapter is self-monitoring in Outcome-Informed Practice. We begin by defining and discussing the purposes of self-monitoring, followed by a discussion of the process of deciding what to measure. We then discuss decisions about when and where the client will self-monitor and provide some examples of forms you might use for this purpose. Next, we discuss how you should engage and prepare your client for self-monitoring, as well as ways of ensuring the accuracy of the data. The next-to-last section discusses the role of self-monitoring in setting goals and objectives. Finally, we discuss the advantages of and precautions you should take when using self-monitoring.